But so often chocolate barks can be just so… bland. 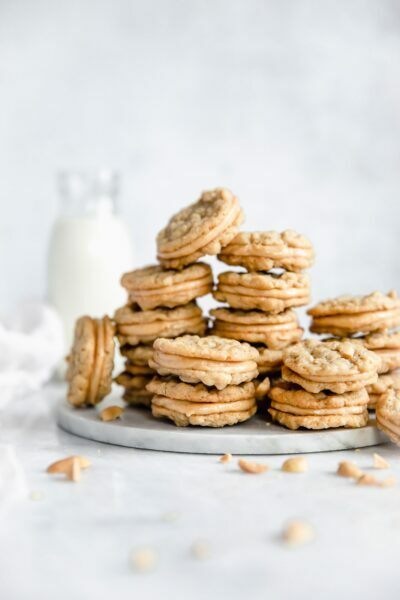 They’re thin and frail, with one teensy bit of topping per bite. Not to mention the quality of chocolate is rarely up to par. 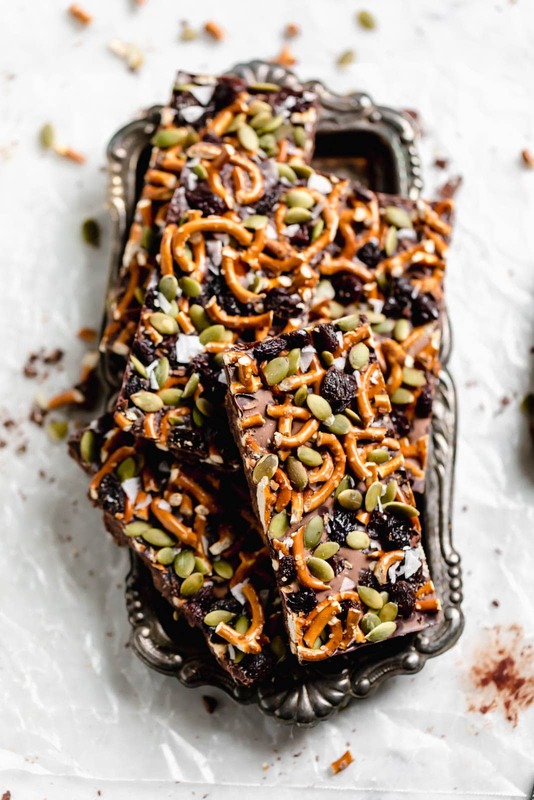 And especially during this time of year when you just want all the cozy things, a wafer-y chocolate bark with 25% of the proper amount of toppings is just not right. 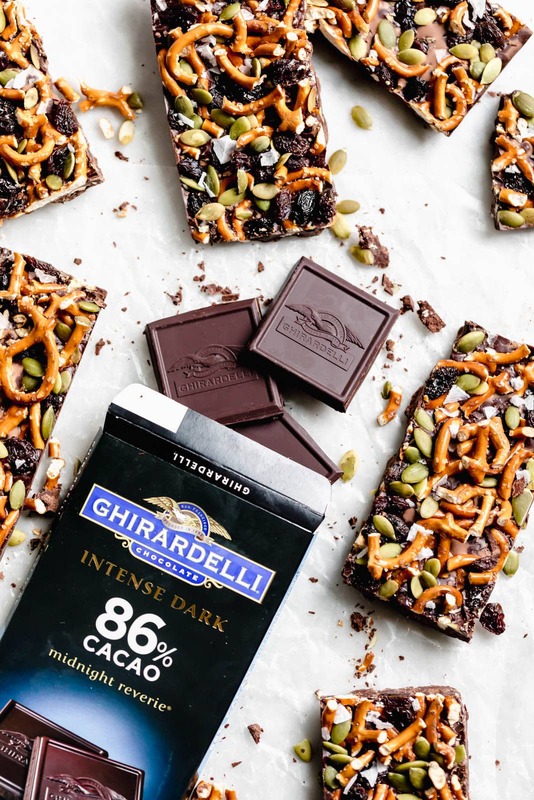 That is why I partnered with Ghirardelli on this post to bring you a thick AF dark chocolate bark made with my absolute favorite dark chocolate, and loaded with pumpkin seeds, pretzels, and dried fruit. I made this chocolate bark using Ghirardelli’s Intense Dark 86% Midnight Reverie Chocolate, which is just a dark chocolate lover’s dream. It has a full-bodied flavor, with hints of dark cherries and dried plums. It is, quite simply, the perfect robust base for a fall-themed bark. Oh, and did I mention that this chocolate bark is nearly 1/2 inch thick? YEAH. 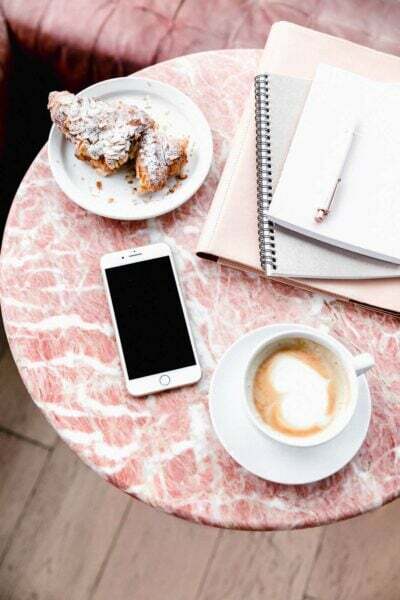 BECAUSE THAT’S HOW WE DO HERE AT BROMA BAKERY. And last. Because this bark is so thick and requires a lot of chocolate, if you’d like to make a smaller amount, cut everything in half and use a standard sized loaf pan as your container. It is the perfect size for a small batch of this bark! Use high-quality chocolate — The chocolate is what holds this entire recipe together (literally), so it’s worth picking up bars of the good stuff. Dark chocolate pairs well with sweeter toppings, like dried fruit, whereas milk chocolate goes well with more savory toppings, like sea salt and nuts. Prep the toppings before melting the chocolate — Once the chocolate is fully melted, you’ll need to work quite quickly. To make your life easier, crush the pretzels ahead of time and measure out all the other toppings you’ll need. 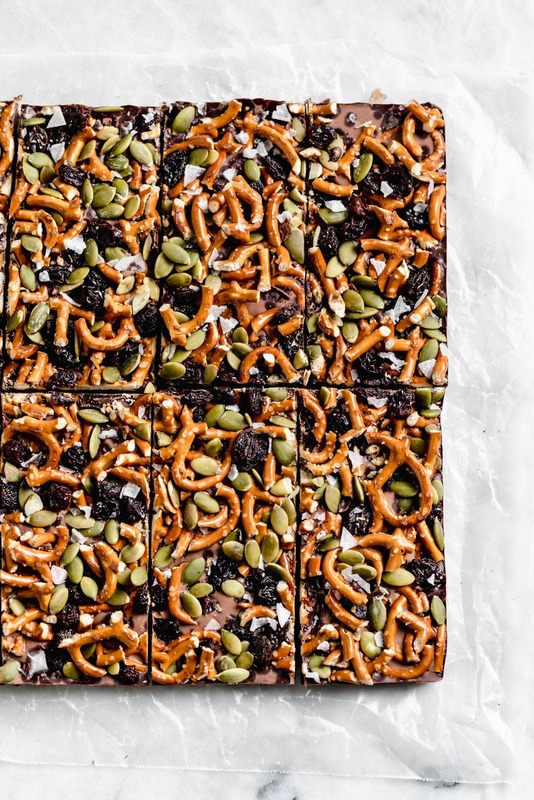 Use a baking pan with sides — Many chocolate bark recipes tell you to spread the melted chocolate on a parchment paper-lined baking tray, but that makes the bark super thin and frail. 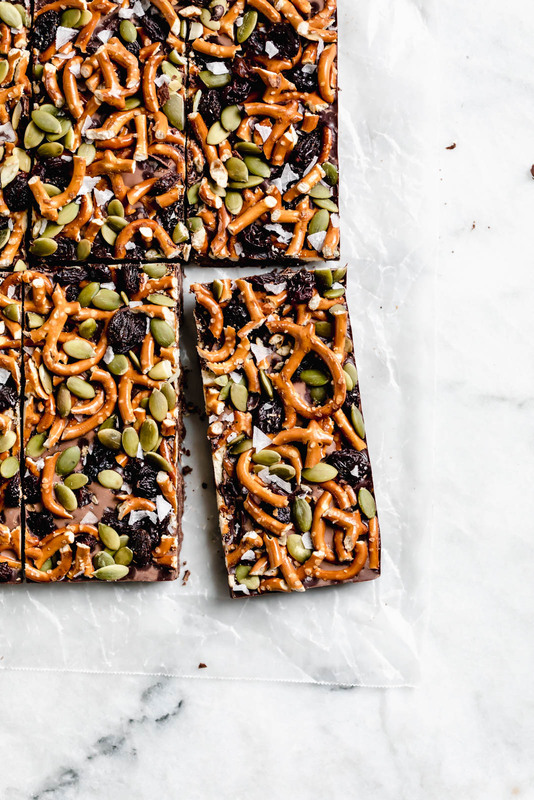 For thicker slices of dark chocolate bark, use a 9-by-9 inch baking pan to hold in all the chocolatey goodness. The chocolate won’t be able to move around, meaning it’ll solidify in thick slices. Switch up the toppings — This dark chocolate bark recipe can easily be customized to fit whatever you have lying in your pantry. 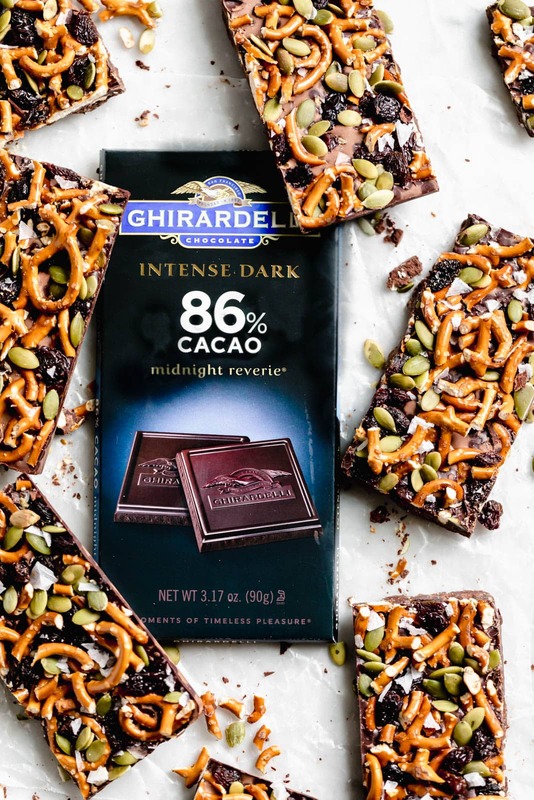 Toasted nuts, different dried fruits, potato chips — pretty much anything tastes great paired with chocolate. Keep your homemade chocolate bark in a sealed baggie or air-tight container. The chocolate itself will last for a long time, but the pretzels on top will go stale if left sitting out for too long. 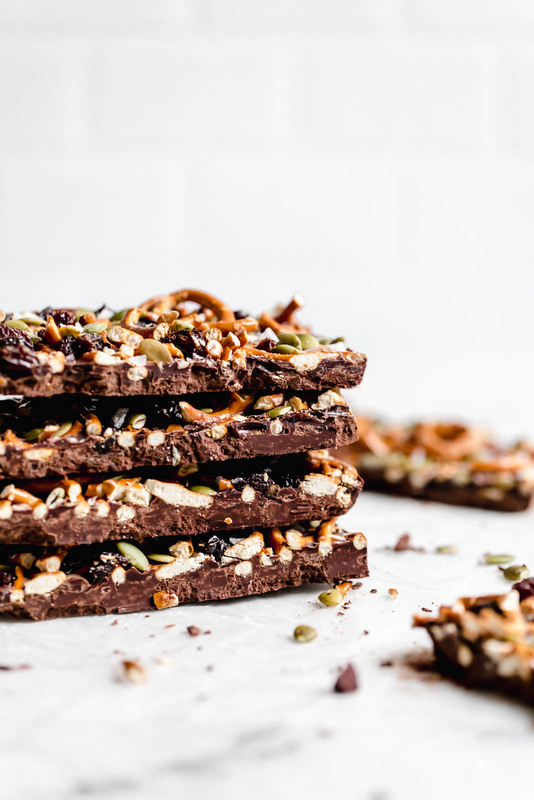 If you plan on gifting this fall dark chocolate bark, I recommend giving it to friends and family within a day or two of making it. 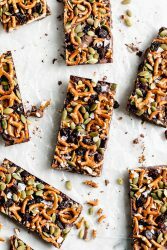 A ridiculously cozy fall dark chocolate bark made with 86% chocolate, pumpkin seeds, pretzels, & dried fruit. Did I mention it’s nearly 1/2 inch thick?! Line a 9″x9″ baking pan with parchment paper on the bottom and all 4 sides. Crush pretzels into pieces with your hands. Have pumpkin seeds and dried fruit measured and ready to go. Set everything aside. Heat a double boiler over medium heat. While the water is heating up, finely chop chocolate. Once the water is boiling, place 2/3 of the chopped chocolate in the top bowl of the double boiler. Use a spatula to stir the chocolate constantly as it melts. 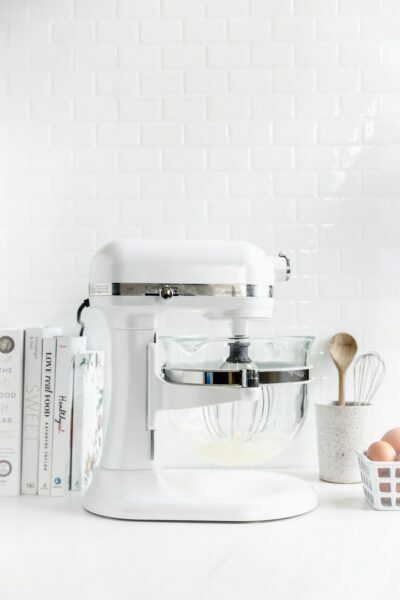 Remove the top bowl and place on a heatproof surface. Pour in the remaining chocolate and allow to sit without stirring for 5 minutes. After 5 minutes, stir everything together. The chocolate should be fully melted and smooth. Pour melted chocolate into prepared baking pan. Cool for 10 minutes, allowing the chocolate to cool down and set ever so slightly. Then, sprinkle with pretzels, dried fruit, pumpkin seeds, and flakey sea salt, if using. Allow to cool completely at room temperature, about 4 hours. Cut into 8 bars and serve! Well! If it’s about 1/2 inch thick, it’s no longer “bark”, it’s a “bar”! This is the prettiest and healthiest bar I’ve ever seen! Yum. These look so good. How many ounces of chocolate are you using? I’d like to try this using sugar free chocolate. Thanks. You are tempting me with these ???? 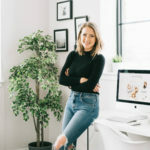 love all of these ingredients, have never attempted to put them together until I saw this bark recipe, thank you!